The Focus RS500 was launched in April 2010. A limited production run of 500 units (101 of them for Britain) were produced. It has a turbocharged 2.5 L5 petrol engine which produces 345 bhp and can do 0-62 mph in 5.4 seconds, with a top speed of 165 mph (266 km/h) making it the fastest Focus yet. The new model was given the RS500 designation to highlight its strictly limited production run of 500 individually numbered vehicles, all of which were offered for customers to purchase. Each RS500 carries a metal plaque on the centre console, hand-engraved with a unique identification number from 001 to 500. This is my rendition of the Ford Focus RS 500. This is a commission build and as such will not have any instructions. This car is a full manual model and features a 6-speed manual gearbox tucked below the miniature inline 5 cylinder, fully adjustable seats, fold flat rear seats, adjustable steering wheel, open-able hood, trunk and doors, closed loop pneumatic e-brake, custom cantilevered suspension with reverse ackerman steering, HOG steering with working steering wheel, spare tire, 4x PF lights at front, 2 PF lights at rear with fully detailed engine and interior. This is my first full manual model, with tons of challenges along the way and a total build time of over a years work. Also thanks @Didumos69 for basic working of the seats and the big push in building and HOG model! For your inspiration for the gearbox! And last but not least @Lox Legofor all the help throughout this build, especially for the photos and video you rock bro! And as always more pictures available on Flickr, click any of those pics to see more! Thanks for the interest. Looks incredible, I especially have to point out those headlights! And the handbrake is awesome! But... No black 5x7 frames? Wow.I just got everything for your Aston Martin. The GT is next but this will be right after assuming instructions are out. Amazing work dude!! Wow! You did it again! 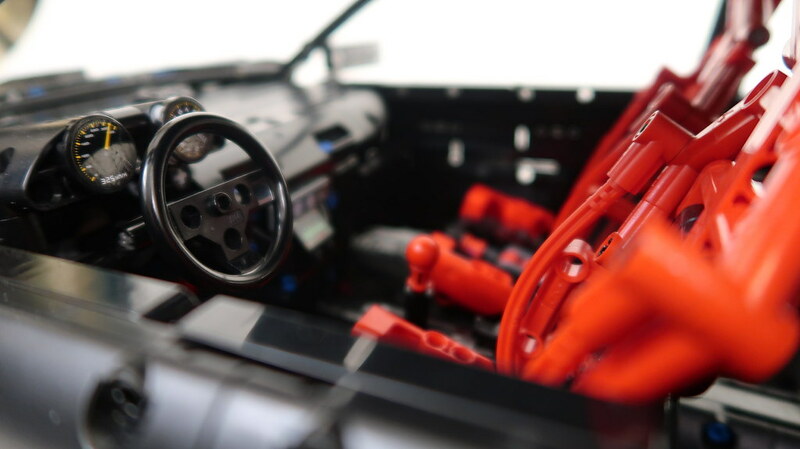 A highly detailed AND highly functional model! And a manual model this time! I also like the inclined plane made by the bottom line of the side windows. That's very hard to do. There are a lot of good looking models out there, but for me this one sticks out because of its perfect marriage between looks and function. Excellent work! EDIT: You should add a custom thumbnail to your video (one of your pictures), the one generated by youtube is blurry. Really nice one. 3/4 pics are showing it in full beauty. Congratulations to Georg (aka @Polo-Freak), the happy customer! He has become a friend of mine over the years, we share the same passion related to Technic Supercars. The Ford Focus is his favorite car – he is driving a real one himself. And now his dream has come true with this faithful and lovely replica on his shelf! ... tons of challenges along the way and a total build time of over a years work. That means – you have put so much work and dedication into this model, I can´t immagine it was just doing a job for a client. You have shown the whole repertoire, including a 6–speed gearbox, pneumatic brakes, precision work on the micro level. Magnificent headlights! Those seats are gorgeous and their mechanics are beyond comprehension. What are these big "scoop" elements in the front (between headlights / under the bonnet)? I didn´t even know they exist. Very clever use however! Fantastic job! I love the front half of the car the most. Headlight and the mask are pure joy to look at. Too bad we won't be able to take a sneak peek into the model instructions, but that is totaly reasonable if it is meant to be one of a kind. There is no ackermann geometry. The pivot point of steering arm should be closer to the wheels when the gear rack is in front of the axle. In your model the pivot point of steering arm is closer to vehicle centerline. 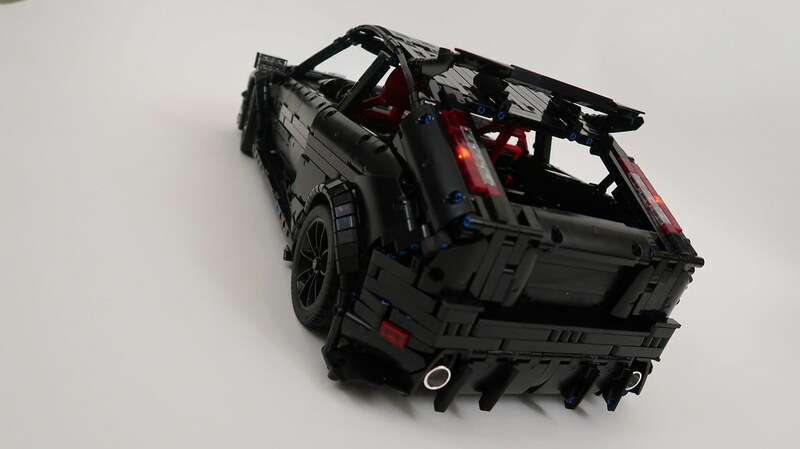 You have created a true Technic masterpiece Dugald! Wow! 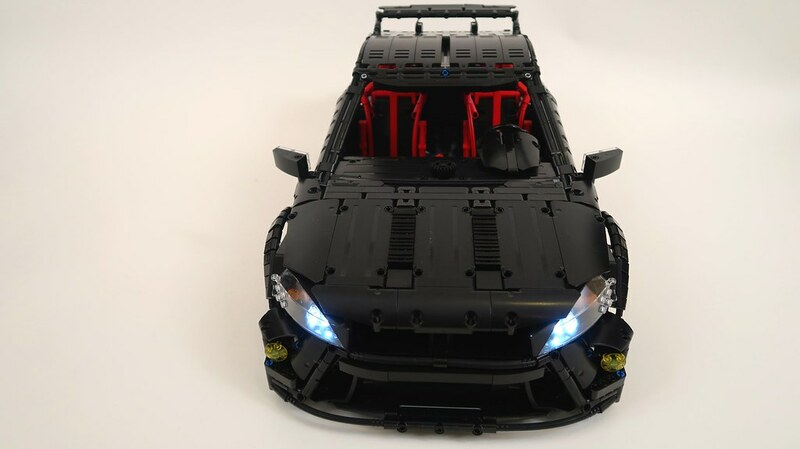 I'm very happy and jealous of the owner who will have both this moc as well as the real Ford RS to drive! I'd be reality interested in learning how the "closed loop pneumatic brake system" works when after you have had some time to recover from this epic build. Thanks in advance. awesome! But... No black 5x7 frames? Thanks! 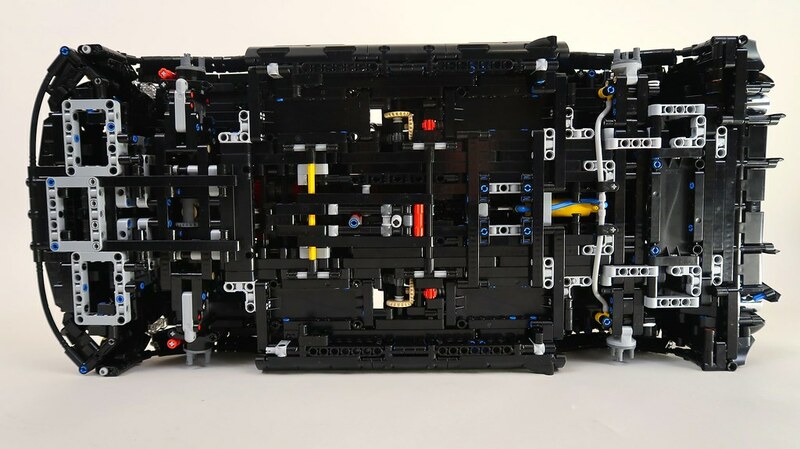 Unfortunately I had already built the entire chassis before those wonderful new pieces came out. It would've look so clean with them though! assuming instructions are out. Amazing work dude!! Thanks for your interest, however unfortunately no instructions will be available as it was a one off commission build. There are a lot of good looking models out there, but for me this one sticks out because of its perfect marriage between looks and function. Excellent work! Thanks Didumos! I appreciate the kind words, you pushed me to build a manual model so thank you, I'm glad you like it! As for the thumbnail, we set it to a good one that we liked but for whatever reason it's showing that horrible one still, hopefully it'll change over. This is one of the best mocs ever made. There are very, very few I think are better than this one. Thanks so much, truly means a lot! 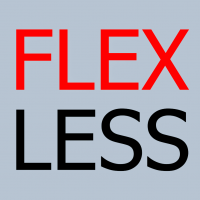 Just a heads up and no teasers but the next build I will be working on will be a dual build with my bro @Lox Lego, it'll be the first dual moc since the FXX. Also you are correct about the hood scoops being Arocs buckets. @brunojj1 thank you! I'm glad you like it, it's a very large and tricky build but it finally came together. I was happy to try out a few of those things that I hadn't done yet like the adjustable seats and ebrake. I didn't want it to be just a pretty model I wanted it to have as much mechanical detail as the outside. It was quite the experience as it's my first commission build and only my second proper MOC. As for the scoops, they are Arocs buckets. I've wanted to use them for quite some time in a moc but never had the chance till now. Fantastic job! I love the front, the photos which are a bit too dark IMHO. Thanks, I've been waiting a long time to be able to use those for headlights they worked to well to pass up but their size and shape is quite difficult to work with. As for the photos I'll be going over them and adjusting colours, we didn't finish up until about 2am so I wanted to get everything posted. I'll let you know once I go over them. There is no ackermann geometry. You are correct, thanks for catching that. It's reverse ackerman steering, I was half asleep when I was posting last night. I'll correct it. Thanks KD! I'm glad so many people are enjoying it. As for ebrake, it's pretty straight forward and I'll explain how it works. Absolutely impressive. Do you have considered to use a transverse gearbox layout during development? 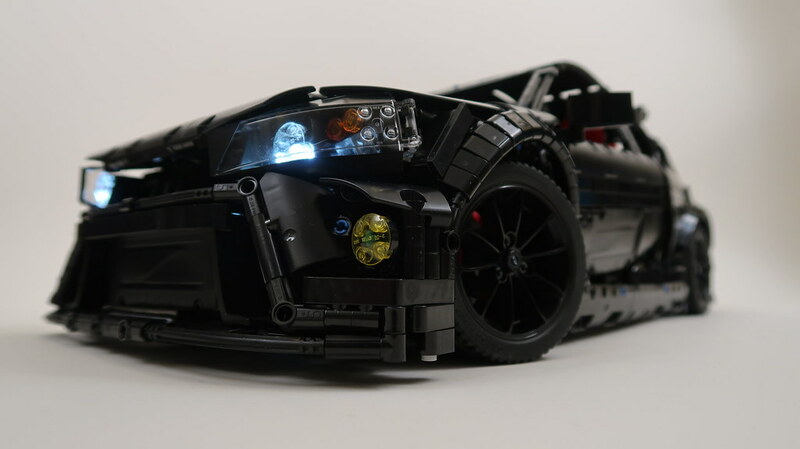 Those are quite rare in Lego Fwd cars, unfortunately. But why the micro engine when the standard engine blocks would have been perfect for this huge scale? It's still really cool though. Did you also mention on Facebook that this was a commissioned build for just the instructions and not the actual model? If this took a year of your time, then those better be the most expensive instructions in the history of mocs. Incredible! In awe at how beautiful this is! It even looks good from underneath! I watched the video and am a bit speechless. Amazing job again! Glad to see the manual transmission turned out well on your first attempt. Pity no instructions as there seems to be many interested. I know many lessons have been learned with this build! I very much look forward to the joint venture with your brother again. Incredible, the curves of the car are brilliant. Dugald, you've done it again. This time completely manual which is a big step for you as this was your first. And my gosh does it deliver! 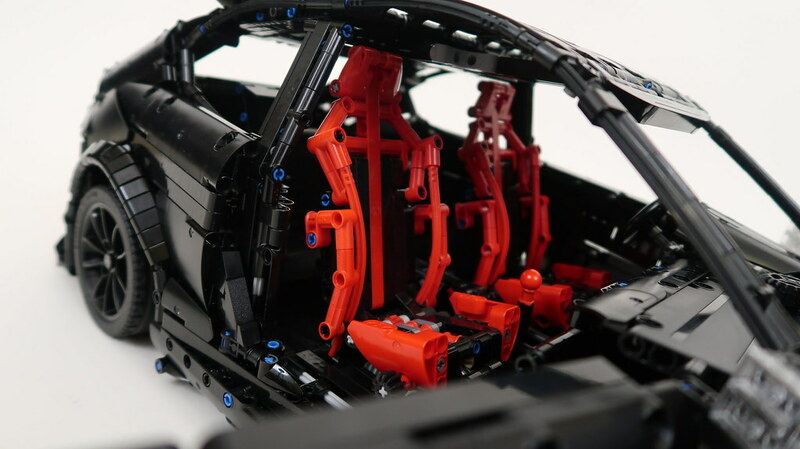 The variety of functions you managed to squeeze into this car in unbelievable, but the way you force yourself to place each component in the correct area of the car is truely inspiring. The completely daunting task of placing a gearbox under the front engine & between the wheels would be enough to scare me away from that build, but you tackled that challenge like a champ. 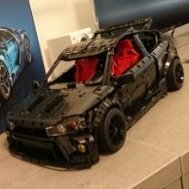 Its a shame the instructions will not be shared, but I know all the lesson learnt on this car will push you to build practically anything moving forwards, RC or not! I can't wait to see whats next from you and am stoked to do a split build with ya as the next project! Well done, and definitely HOF worthy!! @Jim @Milan maybe time for pro tag? considered to use a transverse gearbox layout during development? I tried to work it out but I couldn't figure out a typical shift pattern to match so I opted on this design which works well and retains a typical 6 speed shift pattern. Thanks Meatman! So the engine was out of necessity as the 5 cylinder wouldn't fit properly in the engine bay with the steering linkage, gearbox, and differential. The smaller engine also made room for some fun detail. As for the instructions yes, I love my Lego collection and I hate having to order more so I opted on one off instructions and that way he gets the build experience and I keep my collection but probably not the most expensive, instructions ever sold. Also the build time had plenty of gaps, I've been very busy and haven't had the time to build as much as I wanted so it was often on hold for weeks at a time. Incredible! In awe at how beautiful this is! bravo! Thanks! 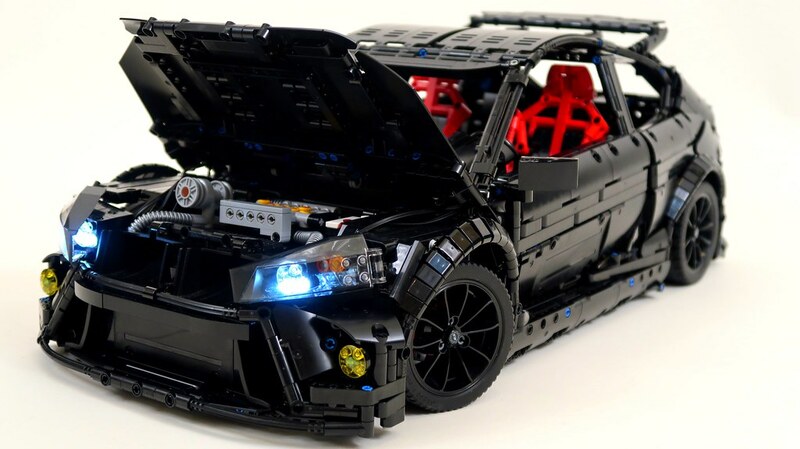 It was by far the most challenging build to date, the low centre console and massive interior space made strengthening the chassis a very difficult ordeal. As such the rockers became major structural areas. Amazing job again! Glad to see the manual transmission turned out well on your first attempt. Pity no instructions as there seems to be many interested. Thanks Technic Addict! The gearbox was tough but I figured it all out in the end, crowkillers was a huge help with the gearing. Well that hopefully won't be too far away, in a month or so I'll hopefully be able to start with the chassis. Epic! pure epic Some pictures are missing. Unfortunately I had to remove one picture, hopefully it isn't still showing that. Thanks, I'm glad you like it. Thank you! They were some very hard curves to mimic. Thanks bro, super helpful having the support, being able bounce ideas off you and all your help throughout the process. Super stoked on the next one B.